Posted by Yilan in Nazi, Yunanistan. Golden Dawn MP Ilias Kasidiaris, who won a parliamentary seat in this year’s elections, has requested that his parliamentary immunity from prosecution be lifted. 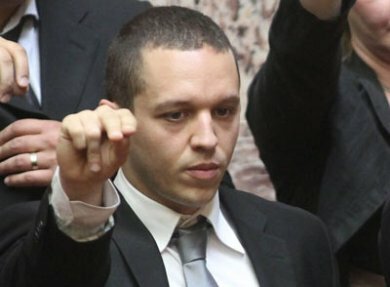 Ilias Kasidiaris is the Golden Dawn MP who sprang to international attention when he assaulted a female Communist MP on a live television show. Prior to his election to parliament Kasidiaris faced charges over an incident in 2007, and was due to stand trial on September 3. However, Greek politicians stand immune from prosecution under a law initiated by PASOK leader Evangelos Venizelos. The immunity applies to Kasidiaris even though he was not an MP in 2007. During Golden Dawn’s election campaign they favored the withdrawal of immunity from prosecution for all MPs. Kasidiaris denies any involvement in the case he was scheduled to stand trial for on Monday. Athens News reported he is accused “of assisting in a robbery, unprovoked grievous bodily harm, illegal weapons possession” by providing the getaway car used by five assailants accused of stabbing a student. To Vima reports that the prosecution has rejected Kasidiaris’s request to have his immunity lifted and recommended that the ban on Kasidiaris leaving the country be lifted.